Yesterday was our first full day in Portland, and what a day it was! We slept in a little, and then hopped right on the bus, and into the downtown. 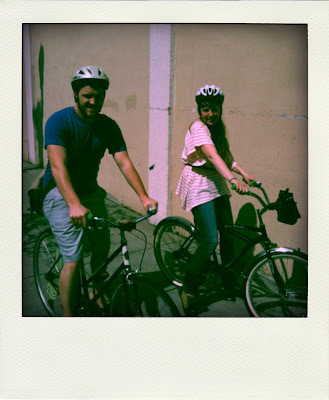 The first thing on our agenda was to rent some bicycles to get us around for the day. We ended up going to Portland Bike Tours, which we highly recommend if your're ever hitting up Portland. The guy who helped us, Evan, was super rad, and let us pick out whatever bikes we wanted (I got a sweet, black cruiser). He gave us a map, a bit of a verbal tour of the city, and for just $20.00 each, we were on our way. It was so worth it to rent the bikes, not only for convenience and speed, but for the amazing fresh breeze you'll get all day! And you can't have a donut without coffee! (Well, I can...) So we headed to Stumptown Coffee Roasters, where Kevin got a delicious cappuccino! Stumptown is the local coffee here, and everyone and their mother serves it with so much pride. 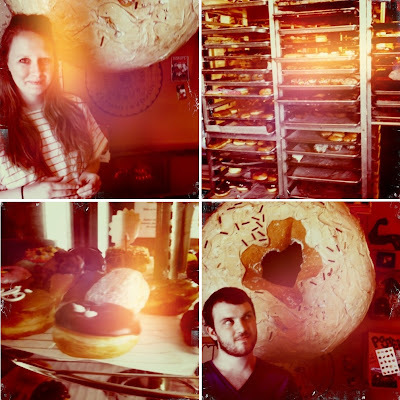 We were so filled with excitement for our hometown java, Red Hill Coffee. We've never told them, but we have visions of a Red Hill coffee bar that is as beautiful (and adored) as Stumptown is here! Come to think of it, there isn't a great coffee bar in the downtown core yet. Perhaps someone will have to fix that (and if they want help, we will be there, Day One!) ... in the meantime, join their Facebook group and help us encourage them in this direction (and get the whole city drinking/loving Red Hill Coffee)! Another great place we saw today was the local art school. Pacific Northwest College of Art is right downtown, and very cool. There were hundred of bikes parked outside, and so many young people in the area. Very reminiscent of Toronto, and our friends from OCAD. Except the school was much smaller...it was pretty much a gymnasium-sized art gallery, with classrooms all around the perimeter. It was a very full and exciting day. We did a lot of shopping and perusing (which I'll post about later) but we eventually got back to our hotel at about 10, and spent the evening in the cigar room, and hopping between the six incredible bars here. We're packing up this morning, and moving on to stay with some (new) friends in the Alberta Arts District. Very excited to see another part of the city, and meet some more people! SOOO glad you are having a blast guys!!! Thanks for the post! 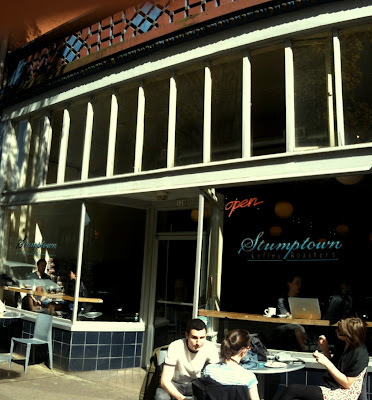 I WANNA GO TO STUMPTOWN!! Okay, I'm gonna keep reading your blogs, but not posting replies, because I want to talk about it when you get to Van! SO EXCITED!! I like that we're on the same coast!